Firstly, welcome to 2018! I’ve been quiet for a while on the recipe front, but I have lots planned for the coming year, so expect lots of updates and new recipes. I’m starting the year off with a recipe I have been cooking a lot over the past six months since I first discovered these little parcels of yumminess. 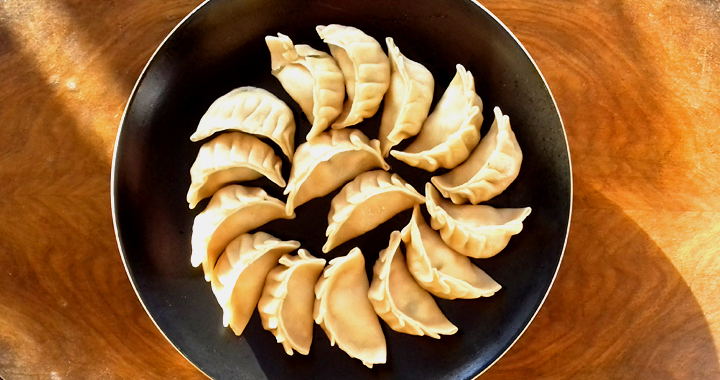 Potsickers are now my favourite kind of dumpling- the perfect mix of steaming combined with crispy fried bottoms, they are cooked in just a little oil, so much healthier than deep fried dumplings. I used prawns here but I have done them with pork and a mixture of pork and prawns too. 1. First make your dough for the dumpling skins. Add the hot water and salt to the flour in a bowl and mix together with a spoon. Once a dough is beginning to form and making sure it isn’t too hot, knead it briefly to smooth it. 2. Roll into a long sausage, coil this up and put back into the bowl, cover with cling film and allow to rest for about half an hour. 3. Cut the prawns into small pieces and add all of the other ingredients, except for the oil. Mix well. 4. After resting, take your dough sausage and cut it in half, to make two. Cut these two smaller sausages into two again. Now cut each of these into four pieces, so you have sixteen discs in total. 5. Lightly flour your work surface and roll the dumpling skin disc once and then turn 90 degrees to roll out nicely round skins. I aim for about the width of my hand (about 9cm). 6. Sit the skin in your left hand, add about a teaspoon of the prawn filling to the centre of the skin and then, starting from the left hand side, pinch the two edges of the skin together. With each subsequent pinch, make a fold back on itself on the edge of skin nearest your fingers, until it is completely sealed into a half moon shape. Place on a plate covered with greaseproof paper. Repeat with the other fifteen dumplings. 7. To make the dipping sauce, simply add the sesame oil, soy sauce and chilli oil together. If you are using the Chilli Hodge Podge, it certainly has a kick so watch out and use sparingly! 8. Heat the oil in a large non-stick frying pan (a wok won’t have enough space!) on a medium heat. Add the dumplings to the pan in a circular pattern, with about three or four in the middle. Fry for 2-3 minutes, until the bottoms are coloured golden brown. Add 50ml of water around the dumplings and cover with a lid or plate. The water will steam off, cooking the dumplings. This take about 6-8 minutes, but keep checking until the water is evaporated. Remove the lid and cook for a final minute before serving. Sometimes it kind of forms a delicate lace grid across the potstickers; I kind of like this so try to serve it ‘whole’. Posted in Main Dishes, Recipes and tagged Chilli, Dumplings, Prawns.